High efficiency of dehumidifying: a strong performance for dehumidifying, large arm is made from high quality air bubble sponge, good air permeability,strong suction, easy to dry. Stable operation: adopt special design for fan blade and motor, low noise, smooth operation for the suction. Easy to use: equipped with high quality iron arm, convenient to pressing collar and cuffs; use energy-saving foot pedal switch to control, easy to operate. Split design: the whole machine adopts separate composite structures, convenient to transport and repair. With the founction of suction and blowing, we can switch between them at will. 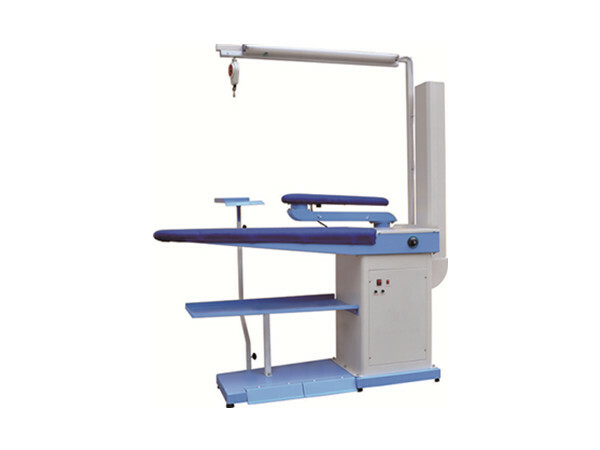 Equipped with upper air duct，guide rail and slide rail, which makes easier to operate the iron. The table and small iron arm are electric heating with inbuilt heating tubes. It is suitable for inoning and shaping such as silk suede suit, women's clothes, dress, casual wear and other clothing.